I was admiring this piece of enamel cookware at a friend's the other night. What struck me most was the way food cooked in it. Chicken, for instance, seared to a delectable golden brown without any effort at all, it seemed. The skins developed an exquisite crispness. I don't know if I could have burned it if I'd tried. Anyone who's tried the same thing in a traditional iron skillet or the standard stainless or aluminum pan knows how quickly things can go wrong. I prefer my iron skillet. Still, it's not perfect. Using the pan above was like driving a Rolls Royce. There were no bumps in the road. So in case you're thinking of making a gift of some sort to The Slow Cook, this casserole would be at the top of our list. Summer is winding down to its final hours and of course that means back to school. As teacher of the "food appreciation" classes in the after-school program at a certain private elementary school here in the District of Columbia, I was invited to join in on some the faculty preparations. One of those was a presentation this morning by the school nurse in front of the entire faculty describing case-by-case the food allergies, asthma conditions and other health issues afflicting each child in the school. I have to say I was surprised by the number of children with food allergies and suffering some degree of asthma. To me, this brings home in a very powerful way all those statistics you read saying that environmental conditions (read pollution, chemicals in the food and in furniture, clothing, beauty products) are pushing the incidence of allergies and asthma through the roof. I have some personal experience with this because my mother suffered symptoms of allergies back in the 70s and of course all the doctors told her it was in her head. All but one Dr. Theron Randolph, who now is regarded as the pioneering founder of the widely recognized field of candida allergies. But that is another story. I also had a cousin who had issues with food dyes. If this morning's faculty meeting is any indication, food allergies and asthma are rampant. Some cases are far more severe than others. But a serious food allergy or a serious case of asthma can be life threatening. Some kids have both. I stopped counting how many kids in this one school are walking around with EpiPens in their back backs in case of an allergy attack. And of course all the teachers have been turned into health care workers, hence the session with the school nurse. They have to know which kids have issues and what to do in case of an emergency. This is one area where confidentiality in medical records does not apply, because the parents want everyone to know that their child suffers a food allergy, and to which specific foods, or that their child has an asthma condition, just in case Johnny stops breathing. In fact, several of the faculty members reported that the other children play an important role in watching out for their classmates who have food allergies. Children at this school are required to bring their own lunches and snacks from home. They are not allowed to share food, mainly because of the allergy issues. But as we learned today, hand washing is extremely important not just before eating, but after eating as well. There have been reported cases, for instance, of children leaving food proteins from items such as peanut butter sandwiches on computer keyboards, only to be picked up later by a child with a sever peanut allergy. Thorough washing of hands with soap and water before and after eating is recommended not only for children, but for adults as well. Also important to remember is that disinfectants kill bacteria, but they do nothing to get rid of the food proteins that cause allergic reactions. For that you need to cleanse and wipe the stuff away, preferably with a paper towel or other disposable as the proteins will stick to a sponge and be transfered elsewhere. The previous day, we after-school instructors met with the nurse for a three-hour video course in first aid. Allergies, including food and insect bites, require training in the use of an EpiPen, basically a hypodermic needle containing a single dose of allergy medicine. You remove the safety cap from one end of the pen (about the size of a really big magic marker) and jab the working end into the patient's thigh. A spring mechanism shoots a rather thick needle right through clothing into the skin. The medicine, we were told, is effective for about 15 minutes, long enough for an ambulance crew to arrive. Except that the response time for the ambulance service at this school for some reason averages around 20 minutes. Be ready to crack open another EpiPen. It was reported today that there is one little boy at the school who has a peanut allergy and thinks he is having a reaction basically all the time. Last year he used his EpiPen on himself a couple of times for no reason. We were advised to keep an eye on him. Last year I made of point of not preparing any food containing nuts or peanuts in our "food appreciation" classes. Too bad for the muffins, but what are you going to do? I planted my beets at the end of March and basically forgot about them. How sad is that? Well, forgotten would be too strong a term. I knew they were there. I cast them a glance frequently in my tours around the garden. But they just never seemed to be getting big enough. Finally I knew I had to do something about those beets. Would they still be edible, nearly five months later? I knew there would be more than we could possibly eat. I decided to pickle them. Isn't the point of pickling to keep large quantities of food for later? I think that was the original point. Now we rarely give a second thought to pickled foods, unless it's some sort of gourmet pickle. But pickles do make interesting gifts, if you happen to know someone who likes pickles, and there are more pickle lovers out there than you might think. Pickling these beets turned into quite a process. First there's the business of getting them out of the ground. I used my forked spade to get underneath them and heave them up a little. Try to get as much dirt off them right there, so it falls back into the garden. I put the beets into a plastic basic to give them a wash. Then cut the stems off with the leaves. I brought the stems and the beets into the house separately. 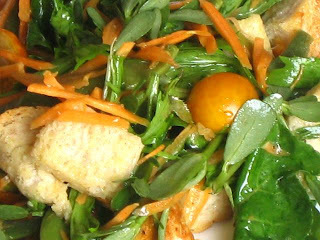 I wanted to cook the leaves, because they are delicious when they are fresh. That means snipping the leaves from the stems with scissors, then filling the kitchen sink with water and washing the leaves. They then go into a hot skillet with some extra-virgin olive oil to cook down. I season them simply with course salt and black pepper. The beets, meanwhile, need to be separated according to size. The smaller ones will cook fast than the bigger ones, of course, so no sense putting them all in the same pot. In fact, I will eventually have five different piles of different-sized beets. I start a big pot of water to boil and give all the beets a good scrubbing in the sink. The beets need to be cooked before the are pickled. I cook them in batches, testing for doneness with a trussing skewer, the lay them out on sheet pans to cool. When they are cool enough to handle, I remove the stem ends and skins with a pairing knife. The skins should peel away very easily. 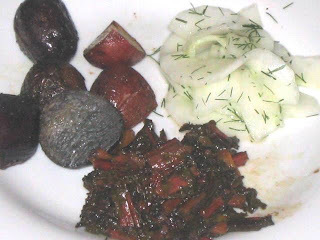 I then cut the cooked beets into pieces and put them aside. Depending on the size of your beets, you can cut them into wedges or slices, whatever you prefer. The recipe I chose for pickling is traditional using vinegar, sugar, allspice, cloves and cinnamon. Jars and lids need to be in perfect condition and sterile. I purchased new pint jars and lids and sterilized them in a large pot with a strainer basket, the same aluminum pot I use for making pasta. Special canning pots and tongs for handling the jars are available. I fashion my own tool for handling the jars by wrapping rubber bands around the working end of my spring-loaded tongs. Place the cleaned jars on a baking sheet and hold them in a 200-degree oven. 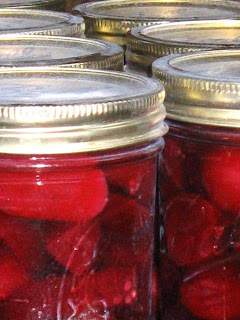 To make 8 pints of pickled beets, you will need 3 quarts of cooked beets, cut into pieces. In a heavy pot, mix 2 cups sugar, 2 sticks cinnamon, 1 tablespoon whole allspice, 1 tablespoon whole cloves, 1 1/2 teaspoons salt, 3 1/2 cups white vinegar, 1 1/2 cups distilled or filtered water. Bring the pickling mixture almost to a boil, then add the beets, again bring almost to a boil, reduce heat and simmer for 15 minutes. Ladle the beets and liquid into hot canning jars, screw on lids and process for 30 minutes according to manufacturer's instructions, which generally means boiling the jars fully covered in the water bath. Remove the jars to cool, then store in a cool, dark place. They should be ready to eat in six to eight weeks. Yesterday we celebrated our friend Tomeika's twenty-seventh birthday and my wife spent the day making Tomeika's favorite foods so we could enjoy a lovely meal together on the terrace. 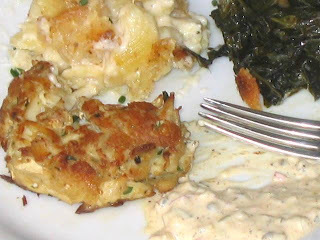 The menu: crab cakes, macaroni and cheese, braised kale with bacon, followed by a German chocolate cake. At this point I need to interject that my wife makes probably the best crab cakes anywhere. For those of you who think crab cakes are something pounded out with lots of bread crumbs, then tossed in a deep fat fryer until the resemble something close to a horse turd, I have news. My wife makes her crab cakes much more in the style of Maryland's Eastern Shore, where the large pieces of premium crab meat are just barely held together with a little mayo, a little mustard and a little fresh bread crumbs (not the stuff out of a can). At the Captain's Table in Crisfield, they are made in just this manner--more a tall pile of crab meat than anything--then finished under a broiler. Or at least they were the last time I was there years ago. 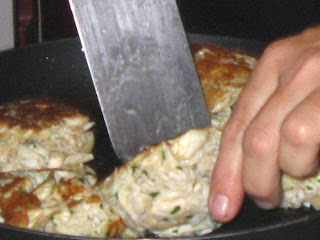 My wife prefers to fry her crab cakes in a heavy iron skillet until they are just browned on either side. And, yes, they do sometimes want to separate around the edges, there's just no helping that. One of our favorite places to eat in the District of Columbia is The Diner in Adam's Morgan. I should amend that to say this is one of the places frequently haunted by my wife, my daughter and our friend Tomeika, often as a group. They particularly favor The Diner's macaroni and cheese and my wife was shooting for something approximating that, but wanted all you readers to know that the recipe she used came from Martha Stewart's website. This is a dynamite macaroni and cheese, with both sharp cheddar and Gruyere cheeses in it and a wonderful crustiness owing to the bread crumbs my wife made fresh from a rustic loaf purchased at Whole Foods. After assembling the dish she poured it into one of our ceramic ovals and baked it earlier in the day. Then just prior to serving she placed it back in the oven t o warm and develop that beautiful brown top. My wife used a round pastry cutter to place rounds of macaroni and cheese on the plates. Finally, it turns out Tomeika is a big fan of greens. But greens prepared a certain way, which is the slow, Southern way that just so happens to be my favorite way with greens as well. These greens in fact were the dark Italian kale I harvested and cooked some weeks back. While they were defrosting, I sauteed a quarter-pound of slab back, roughly chopped, in some olive oil. When all the grease had been rendered, I removed the bacon and sauteed a whole Vidalia onion c ut into thin strips. Then I added back the bacon and about seven cups of chopped kale along with a tablespoon of apple cider vinegar and let everything cook very slowly in a heavy pot for about 45 minutes to meld all the flavors. It's a long walk from the kitchen to the terrace. My wife plated the food restaurant-style and we walked the plates out there and had a beautiful meal. 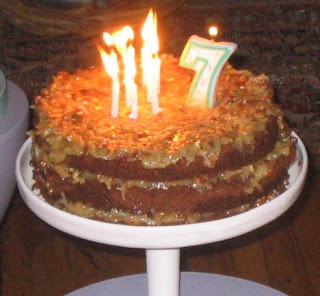 Our friend Darren joined us and we topped it off with the German chocolate cake with vanilla ice cream and candles. I think Tomeika was pleased. 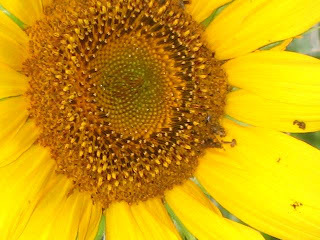 The sunflowers this year were tall and majestic, presiding over the garden with their giant yellow blossoms. They fed birds and squirrels with their seeds, and gave passing motorists and pedestrians something grand to gawk at. 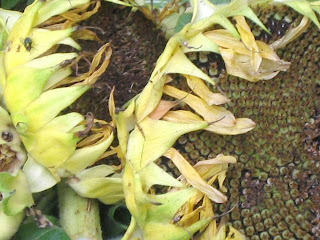 But now they are fading, their long, thick stems groaning under the weight of their enormous seed heads. 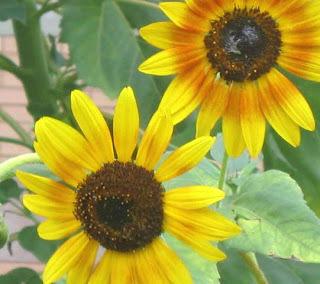 It is time for the sunflowers to submit to the compost pile and help feed next year's garden. You never know what delights you might come across messing in the garden. Today is supposed to be one of the hottest of the summer so I was out early weeding. The bed where I have been growing beets was mostly overrun with crabgrass. And I should say I've been completely derelict about harvesting those beets, but that's another story coming up soon. I want to get this bed ready for planting salad and other greens for the fall. So it was time to do a little digging with the forked spade and get down on all fours to get my hands dirty. The spade sinks easily into the soil. We've had a fair amount of rain lately, which makes weeding all the more easy. I grab clumps of grass and they come up with great root balls. Shake them vigorously and knock them against the ground to remove all that rich soil and save it for the garden. In the process, I uncovered a lovely bunch of arugula--a complete surprise, since the arugula I planted in the spring bolted back in May. I hate to be without arugula in the garden, so this was a great find. I set it aside. Then, not too much later, I pulled up a handful of perfectly happy mizzuna, hidden in the grasses. Only my love for arugula surpasses my feelings for mizzuna. Its peppery bite is a flavorful addition to salads, so I set that aside as well. Plunge spade, grab weeds, throw weeds in bucket for compost pile--I was moving right along. Then I noticed one, then two, then three clumps of purslane. Purslane is a succulent with redish stems and clusters of small round leaves. It grows like a weed around the garden or sometimes out of cracks in the sidewalk. It is edible, and just recently I learned that purslane is the number one source of Omega-3 fatty acids among green leafy vegetables, those being the same heart-healthy Omega-3s that are so sought after in fatty fish such as salmon. Personally, I think purslane is an acquired taste. The flavor is mild and somewhat citrusy, but the texture can be mucilaginous and off-putting. I can't stomach it cooked (give me okra any day). 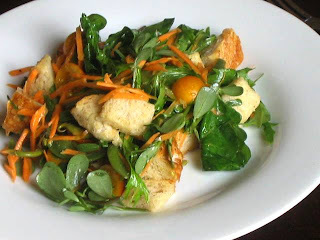 But I was confident it would blend nicely in a salad with the stronger tasting arugula and mizzuna, and then I'd have the benefit of all those fatty acids, as well as the many vitamins purslane confers: A, C and E, plus potassium, calcium and iron. By the time I'd finished weeding, I thought I had the beginnings of breakfast. A nice plump carrot had offered itself during my digging. I cleaned that and ran it through the mandoline for julienne. I also had some yellow cherry tomatoes picked a couple of days ago, a few cooked green beans stashed in the fridge, and part of a loaf of rustic bread that I turned into cubes. 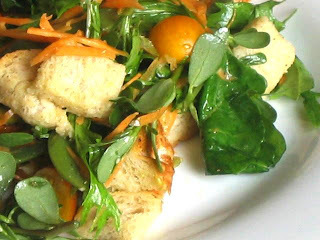 So here was the finished salad, foraged fresh from the garden: arugula and mizzuna leaves, purslane, julienned carrots, cherry tomatoes, green beans, rustic bread. Drizzle with extra-virgin olive oil, lemon juice and a bit of rice vinegar. Season with course salt and freshly ground black pepper. Some goat cheese or grated parmesan would work nicely as well. 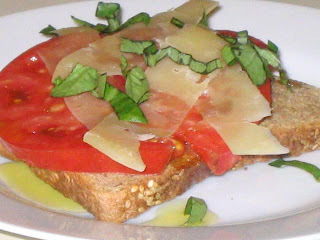 Bradywine tomato slices from the garden on multi-grain toast with shaved Parmesan and chiffonade of basil. Drizzle with extra-virgin olive oil, season with salt & pepper. Total impulse snack. Time involved: 3 minutes, mostly waiting for bread to finish in the toaster. A memory from childhood stands out: Playing in the garden and running smack into a garden spider's web. Well, not actually into the web, but pulling up just short, like in a cartoon with heels dug into the dirt and a screeeeech! And finding myself looking right into the eyes of the biggest spider I'd ever seen. The image of that spider--suspended in its web waiting for the next victim--is one that returns in my mind's eye over and over, who knows why. I've always been both fascinated by and terrified of spiders. In college, I would capture a garden spider like this one and use it in an experiment to test my hypothesis that spiders could be raised on a large scale and used in farming as an alternative to insecticides. I think I got one crop of spider eggs before the experiment fizzled. 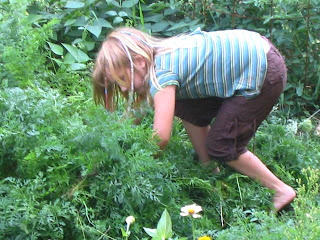 The garden was an important locus of childhood activity. My father had broken the sod behind our small lot in suburban Chicago. It wasn't really on our property, but just beyond the property line on land belonging to the county forest preserve. Nevertheless, my father tilled it as if it were our own. He grew rhubarb, and in the spring there would be a big pot on the stove cooking huge quantities of something we called "rhubarb sauce," consisting of the stalks rendered into a smooth mush with copious amounts of sugar. For weeks, it seemed, we would be eating "rhubarb sauce" for breakfast, "rhubarb sauce" for lunch, and "rhubarb sauce" on our ice cream after dinner. Open the refrigerator and you'd see pitchers of "rhubarb sauce" lining the shelves. He also grew tomatoes, and there were times when I'd secretly grab a salt shaker from the kitchen and make my way to the garden to look for a ripe fruit. They always seemed so large and taught and warm, those tomatoes, and reaching into the plant for one would leave your hands stained green and smelling of that tropical, fecund tomato smell. 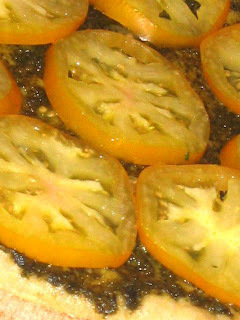 You'd find a good spot on the tomato, give it a lick with your tongue to moisten it then sprinkle a bit of salt. 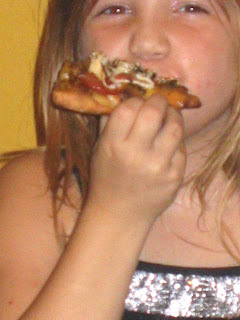 You knew what was coming next: The first bite always exploded with juice that dribbled down your chin and shirt front. Then another shake of salt, another bite, and so forth, slurping and sucking until there was nothing left but the stem end. After that you sat on the ground with a tomato stain running down your chin and shirt, your belly feeling warm and satisfied as if filled with the sun. When we weren't playing baseball, we'd be at a friend's house for long, lazy bouts of Monopoly. The radio would be tuned to the Cubs with Jack Brickhouse announcing the play-by-play. Ernie Banks was in his prime in those days and our greatest hope, sitting around a picnic table playing Monopoly, was that Ernie would knock one over the vine-covered brick wall at Wrigley Field so we could hear Jack Brickhouse rise up out of his chair and scream, "Hey, hey Ernieeeeeee!" 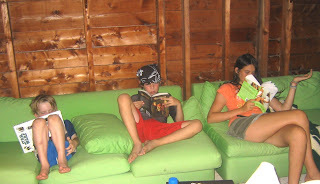 It seems to me we were content. There was not a lot of driving around in cars, no traffic jams, no spending the day cruising the mall or rolling dinners at McDonald's. We had our sense of community right there in the neighborhood. We didn't want for more. And that may be the sense I am trying to recreate with our garden and growing our own food here in the District of Columbia. Some people measure progress by how much more we have than our parents' generation. More money, bigger house, bigger cars, more time spent eating at restaurants, longer vacations. But I'm not sure all that is true. I'm not sure that is a good measure of progress. I think we can be happier with fewer of those things, and more of the feeling of belonging--that sense of connectedness--we had as kids playing in the garden. If you've spent any time at all reading recipes you haven't escaped the standard admonition when preparing beets to be sure to use the beet greens. Not only tasty, are these greens we're told, but so darned good for you as well. To which I respond: Have you ever tried actually cooking the greens that typically come with a bunch of beets at the grocery store? First, the beet greens you usually find in the grocery store aren't very appetizing at all. They look old and ragged, probably because the average beets in the average grocery store have been in transit and in storage for a week or more. Secondly, after you separate the good leaves from the bad and trim them and wash them, what you get after turning them over a couple of times in your cook pot is a whole lot of nothing. Even if the leaves had a fair amount of life to them when you bought them, they cook down to such a small amount that you question why you bothered at all. How many beet greens do you need--really--to make a meal? Finally, there's the matter of flavor. Try as I might to actually consume the beet greens from the supermarket, I can hardly swallow them. The flavor's not there. I don't see the point. The solution hit me like a flash as I was preparing the beets. After removing the stems what lay before me on my cutting board was a pile of the most gorgeous beet greens you've ever seen. Big, strapping, luxuriant greens. These were the antidote to every bad experience I'd ever had with beet greens. And why not? They'd just been plucked out the garden. They couldn't have been fresher. I didn't have time to search for a fancy treatment for these greens. Somehow, they had to make their way into a six-egg frittata. So I did the easiest thing I know of, which is to heat some extra-virgin olive oil in the bottom of my cast-iron skillet. I washed the greens, then tossed them a handful at a time into the skillet, turning them as they wilted to make room for more. As I said, beet greens will cook down quite a lot and these greens did shrink as well. But when all was said and done, these greens were meaty. These greens had muscle. And the flavor? Oh, mama! I could have eaten these greens all night, seasoned with just a shake of course salt and some freshly-ground black pepper. But there was no time to dilly-dally. When the beet greens were cooked through, I used my tongs to squeeze the excess moisture out of them right there in the skillet, then gave them a quick chop and transferred them to my fittata pan. Sauteed onions, beet greens, parmesan cheese--that was some frittata. This morning I went out to the garden with a new mission: find more beet greens. A break in the weather here in the District of Columbia dropped temperatures low enough to consider a rare summer event: pizza. We try not to use the oven when it's sizzling outside. So this was our chance to put some of the summer bounty on a crust. How do you like your pizza? Me, I'm a thin crust kind of guy. And I think it's safe to say my wife makes the best pizza crust anywhere. Thin, chewy, just enough flex with golden bits of flavor around the edges. She uses a two-step process to cook the pizza. 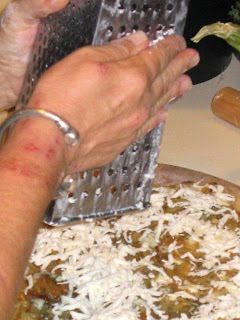 After the dough has risen and she's rolled a piece into a pie shape, she slathers on a sauce and transfers the pie to a pizza stone at the bottom of an extremely hot oven. When the pie is cooked through but not quite done, she removes it and then lays on the toppings and the cheese. Then the pie goes back into the oven to finish, notably when the mozzarella has completely melted into a pool of deliciousness and the dough has baked to a golden crispness. This time of year we are looking for pizzas to show off our produce. 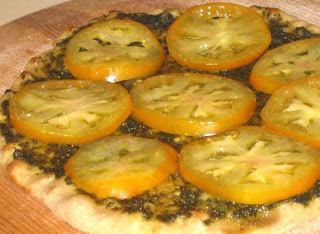 A favorite is a pesto pizza topped with "Nectarine" variety of tomatoes. Grate some mozzarella over the tomatoes, then a healthy shaving of parmesan after it comes out of the oven. Another delicious pizza is caramelized onions with gorgonzola cheese. The pungency of the cheese is a perfect foil for the sweetness of the onions. But you could also top your pizza with cooked greens or broccoli or peppers--whatever vegetables happen to be ripe and ready for harvest. My wife is the baker in the family and she's spent quite a long time studying pizza crusts and searching for the perfect recipe. Her favorite is the one from The New Best Recipe cookbook, from the editors of Cook's Illustrated magazine. This recipe calls for some whole wheat flour in the dough, which gives the finished pizza extra chew and flavor. Bread flour gives the dough its crispness, but all-purpose flour can be used as a last resort. In a food processor, process 2 cups (22 ounces) bread flour with an equal amount of whole wheat flour and 1 1/2 teaspoons salt. Continue pulsing while pouring in all but a few tablespoon-fulls of the liquid ingredients through the feed tube. If the dough does not readily form into a ball, add the remaining liquid until a ball forms. Process about 30 seconds more, or until the dough is smooth and elastic. Using a rubber spatula, turn the dough onto a floured work surface and knead by hand a few strokes to form a smooth, round ball. Place the ball in a deep, oiled bowl, cover with plastic and allow to rise until it has doubled in size, up to 2 hours. Press the dough to deflate and proceed to make your pizza pies. To finish the pies, divide the dough into four pieces. Roll each piece to your desired thickness (we shoot for about 1/8-inch). The pies don't have to be perfectly round. 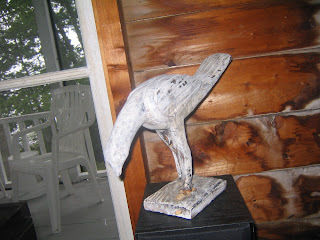 In fact, we like them better on the rustic side. To bake, follow the steps described above, brushing your sauce on the dough first, then laying on the other toppings and cheese after the dough is cooked through, then baking the pizza briefly a second time. We turn our oven up as high as it will go, around 550 degrees. But hotter would be even better. Why the two-step baking process? My wife swears this prevents the cheese and other toppings from draining liquid onto the dough before the pie has a chance to cook. Nobody likes a soggy pizza. Anyone who gardens will see volunteers cropping up in his plot from time to time. These are plants that were not planned, that were not deliberately seeded by the gardener, that germinated all on their own and from who knows where. Volunteers can be vexing or a complete delight, depending on the gardener's mood and how finicky he is about his garden design. Tomatoes, for instance, produce seeds that are nearly impossible to kill. Often they find their way into the compost pile, which then gets spread around in the various garden beds. So you often will see tomato plants sprouting everywhere and in the most unlikely places. Sometimes I let these plants grow just to see what they will do. Last year one of my most productive tomato plants was a volunteer that popped up in a far corner the garden--I have no idea where it came from or what variety it was. Volunteer tomatoes are so thick at times you end up plucking them out like weeds. This year it was cucumbers making unscheduled appearances. Once again, I didn't have the heart to remove them. If they are going to go to all the trouble of sprouting and surviving on their own, I figure they deserve a break. But vining cucumbers can be a nuisance once they are loose in the flower bed or twining among the edamame. Then they very often hide their fruits in the darkest places where you can't see them, so in the end you don't take any advantage from their being in the garden at all. And just when I was complaining that we had no black-eyed Susans this year, a patch of them suddenly sprouted at the end of the cucumber bed. Really, I don't know how they made their way there. But I let them grow and spread their happy faces, even though they were completely out of place. Recently I noticed another plant growing taller and taller among the beets. It was the only plant of its kind, spreading almost into a small bush, and I naturally assumed it was a weed. I only saw it from a distance and planned at some point to walk over and pull it out of the ground. Finally I did make my way over there for an inspection and discovered it wasn't a weed at all, but a rampantly healthy Thai basil plant, maybe the happiest basil plant I'd ever seen. Again, no idea where it came from. We had never planted Thai basil in that area. Perhaps a seed had drifted over from the patch of Thai basil we'd planted at the opposite end of the garden a year ago. Yet we had never seen any plants this vigorous or grown to this size. There was nothing to do but eat it. I'm no expert in Thai cooking but we do love it. Often the process of producing a Thai meal is rather involved, just finding all the ingredients, and there usually are a lot of different ingredients in a Thai meal--herbs and spices and peppers of various kinds. We do have some Thai and Asian groceries in the area, but they require a trip. So I was determined to make this meal from items we already had on hand, and use as much of our newly discovered Thai basil as possible. I started by sauteeing several of the small onions from our garden, sliced lengthwise. Then I thinly sliced two chicken breast halves and sauteed these as well, setting them aside for later. Now in the saute pan combine a cup or more of coconut milk, two tablespoons green or red prepared Thai curry paste (you can make your own curry, but it is rather involved), one tablespoon fish sauce, two teaspoons palm sugar (or light brown sugar), a small knob of ginger, peeled and cut into very thin match sticks, three or four kafir lime leaves (we keep them in the freezer), a fistfull or two or Thai basil leaves and the sauteed onions. Bring the mixture to a boil, stirring the curry paste into the coconut milk, then reduce heat and cook at a slow boil for about 1/2 hour, or until the liquid has thickened a little. Taste and adjust seasonings as necessary. The basil leaves will almost disappear. Don't be afraid to add more, as you will still have lots left on your Thai basil plant. 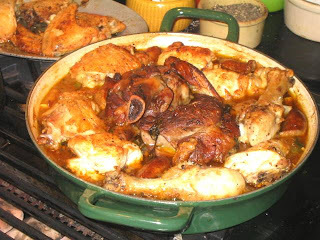 While the sauce is simmering, add one can of straw mushrooms, drained, and the sauteed chicken. Continue cooking until everything is heated through. If there is not enough sauce, or it is too spicy for some reason, don't be afraid to add more coconut milk. To serve, ladle the curry with the chicken and mushrooms into shallow bowls over brown basmati rice. A Singha beer is the perfect accompaniment. 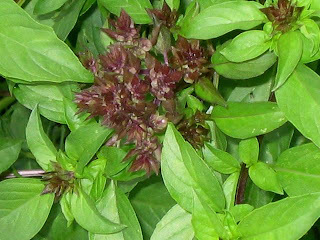 With any luck, your Thai basil plant will still be as vigorous as ever, meaning you must now find another recipe that calls for lots of Thai basil. Managing a garden for food tests my ability to walk and chew gum and the same time. I can't decide whether this is more like playing at air traffic controller or valet parking attendant. It's just not as simple as tossing a few seeds in the ground and waiting for dinner to appear. Vegetables mature in their own good time, according to the rules of soil, rain and sun. And of course you didn't imagine they shared the same schedule, all coming to ripeness at the same time and putting up a sign that says, "I'm done." No, there's a good amount of tracking that must be done, attention that must be paid first to make sure that the carrots and radishes are harvested before they go woody and that the cucumbers and green beans aren't spoiling on the vine. But just as important is having a clue what to plant next when those earlier vegetables are done and to plant the new seeds at the appropriate time so they have a chance to grow and produce before the season turns. That is, if you want to keep your soil in constant production and have something to eat tomorrow--and we certainly do--a certain amount of timely action must be taken. We and nature both abhor an empty patch of soil. Gardeners call this "succession planting," ensuring the garden is always producing something for the table. For instance, it was pretty clear that my bed of Italian squashes, cucumbers, onions and edamame beans was spent. We had already pulled the bean plants and harvested the edamame. The cucumbers and squashes both had produced admirable quantities of vegetables. They would all be pulled out of the ground, cut from their trellising and dispatched to the compost pile. Now I had a vegetable bed four feet wide and 20 feet long. What to put there? Well it just so happens this is the time to be planting root vegetables for the fall and winter. And it just so happens I have several seed packets for "laurentian" rutabaga. It also just so happens that I am determined to grow some worthy beats. Turnips are also on the agenda. A quick read of the seed catalogue confirms that I have just enough time to grow these rutabaga (95 days to maturity) and bring in a crop around Thanksgiving. Of course, I could always pick them early if need be. The first order of business is preparing the bed. 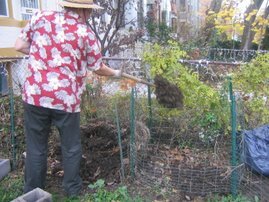 I rake up the half-rotted straw that I had placed (before it was rotted) back in May to hold back weeds. Next I dig into one of my compost heaps and lay a layer about 1-inch thick on my vegetable bed. I work this into the soil with a stirrup hoe. The soil is rich and soft. But just to make things a little easier for my root crops, I work the entire bed with my forked spade, plunging the spade deep into the soil and easing the tool back and forth just enough to loosen the subsurface. Rutabaga, a cross between a turnip and a cabbage, is one of your bigger root vegetables. Some people think of it as one of those vegetable dishes to be avoided at Thanksgiving, but I love the earthy, somewhat bitter flavor, especially after applying some kitchen magic and turning it into a creamy bisque or a cheesy souffle. I had tried planting rutabaga last fall, but too late. I scattered seeds and they germinated all right. But they never grew larger than a pencil-thick root. Part of the problem, I recognize, is planting the rutabaga too thickly, then neglecting to come back after the plants have begun to grow and thinning them. I hate thinning. So my new system is to make individual holes for the seeds, properly spaced for them to grow into mature plants. In the case of rutabaga, this means six inches of spacing between seeds. So I am on my hands and knees, the tiny black seeds--perfectly round, like miniature buckshot--poured into one hand, plucking out seeds with two fingers from the other hand and plunging the seeds into the soil at six-inch intervals. First one row of seeds, then another and another, until I've filled up fully half my bed. It's a large area and potentially a lot of rutabaga. Enough, I think, to get us through the winter and into spring. Not all the seeds will germinate, I know. So I am prepared to come back and plant more seeds where holes appear in the pattern. Now it's just a matter of keeping the soil moist, meaning watered once or twice daily, until the seeds germinate. Vacancies are appearing elsewhere in the garden--for instance, where I am harvesting the carrots and beets planted earlier in the year. I have seeds for radishes and lettuces, arugula and mizuna--all cool-weather crops waiting their turn in the fall rotation. And in case you think this is pure genius, that I have some kind of master plan for all these substitutions and seasonal calculations, I can assure you that is not the case. That is why I call this "opportunistic" gardening. I just go where the holes are and grab something out of my bag of seeds. Of course, there are things to consider, such as rotating the crops. You wouldn't want to be planting Brassicas in the same soil, over and over, for fear of encouraging pests and diseases. Things need to be moved around--rotated--to promote soil health and increase production. More than anything what this involves is grabbing the big bag of seed packets I keep in a crisper drawer in the refrigerator and periodically sifting through it to remind myself what I should be planting next. I spread the seed packets across the kitchen table, setting aside those that need to be planted now--or soon--and making a note of seeds that are lacking. I just placed an order for more arugula, turnips, radishes. It's also time to start thinking about ordering garlic sets for the fall planting. So there you have it. Food at random. Vegetables by accident. Whatever you want to call it, it's dinner to us. I have a confession to make about last year's pickles. I don't think they were that great. We made quite a large quantity for my "food appreciation" classes at the private elementary school where I teach here in the District of Columbia. The kids were wild for them and we served them at the parents' night dinner. Some of the parents even requested jars to take home. The pickles were okay. But they were missing a certain zip. This year, I'm pleased to announce, we've got the zip. 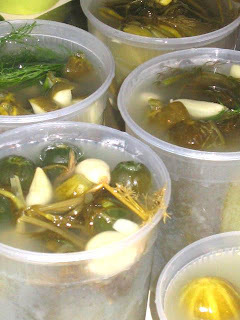 These are fermented pickles, meaning they cure in a salt brine and when finished resemble those "kosher dills" you remember being served with your pastrami sandwich at the Jewish deli. I may be halfway over the learning curve because I've become rather adept at stopping the fermentation process at just that point when the pickles have absorbed the garlic and dill flavors and still retain the bright fresh color and the crunchy cucumber snap. Some people call these "half-sours." If you let the cukes ferment much longer, they turn a deep, dark green and become somewhat softer--not completely flaccid, mind you, but somewhat beyond snappy--more like the standard dill pickles you find in a jar at the supermarket. These would be "full-sours." Not fermented enough and the pickles are missing the proper flavor and aren't cured all the way through--they taste more like salad. Somehow, August doesn't feel like pickling season and with the temperatures this high, the fermentation process moves right along, more quickly than it might in the fall when things are cooler. But this is when the cucumbers are ripe for picking. You can't let them sit around and go bad, so into the brine they go. At current temperatures, the pickles seem to reach the proper flavor and consistency for my taste somewhere between five days and a week in the brine. At this point, they need to be refrigerated to stop the bacterial action and arrest the fermentation process until you are ready to eat them. I've made several buckets of pickles recently and yesterday was the designated day to put them away for storage. Even the cukes that had grown v ery large on the vine while we were on vacation pickled to a crispy, garlicky turn. I cut the cukes in half lengthwise, then cut these pieces in half and sliced them into spears to fit quart-sized plastic containers. Add a few garlic cloves, some dill stems and top off with brine. Then place the containers in the fridge. 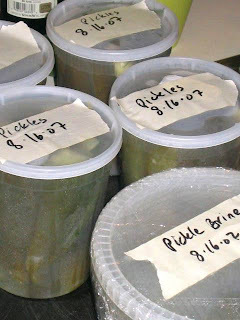 I also saved a large container of brine, in case the pickles need to be topped off at some point in the future. Unfortunately, I cannot tell you how long these pickles will keep in the refrigerator. I just don't have enough experience with them, and I'm not sure they won't be eaten well before they expire. But judging from the fermented sauerkraut I made last December, which remains delicious in the fridge to this day (note to self: eat more sauerkraut), these pickles should keep for a good long while. I couldn't help munching on the pickles as I worked, they are that good. Pretty irresistible, in fact. I was pining for that pastami sandwich. I would have settled for tuna fish. Some batches turned out better than others, meaning I just have to keep a closer eye on things next time. My cucumber plants are exhausted at this point. Fortunately, you can buy pickling cucumbers at the farmer's market or the Whole Foods and, unlike mine, they will be about the right size for canning, not the monsters I've been using. So I will be making some mean pickles with my "food appreciation" students this year. My garden journal tells me it was May 1 that I planted my bed of cucumbers, onions and Italian "striata" squash. I also planted edamame, or soy beans, for the first time. We pulled those plants weeks ago and blanched the beans, freezing most of them for later. Yesterday was time to dig up the rest of the bed and start thinking about a fall or winter crop. I sank the forked spade into the soil and started lifting around the weeds. Up came onions I had not seen--set those aside. Out came the squash plants--they are sprouting new leaves and blossoms, but really they've done their job. The cucumbers are looking tired as well. I've trained them to grow up strands of butcher's twine hung from a PVC frame. I'll let the few remaining fruits grow a few more days. Then it will be their turn to contribute to the compost pile. As I turn the soil, I see the remnants of the layer of straw I laid down three months ago to hold back weeds. The straw is half-rotted, telling me I'm not alone here. The soil is teeming with micro-organisms munching away on the organic matter. They give the soil that fresh, fecund aroma that can only be described as "earthy." That is a sign of a healthy soil that is getting healthier all the time. The bacteria and fungi and nematodes and other creatures--all too small to be visible, but numbering in the billions--are the real workers here, breaking down matter into molecular bits, releasing nutrients and feeding my plants in the process. I am just a walk-on player, the guy who comes along and stage-manages. In the end, this is where food comes from, that part of an endless cycle of birth, death and decay where we get to interject, gathering what the good earth offers so that we, too, can play in the cycle. This is the second day of full-on harvest from our front yard garden here in the District of Columbia, about a mile from the White House. I am not trying to invent anything new by way of cuisine, not trotting out any fancy recipes. We are just eating from what we have sown, food simply and efficiently prepared in all its freshness and fullness of flavor. In another bed we planted more than two dozen potato sets. The plants have since faded. You'd be hard-pressed to know they were ever here. 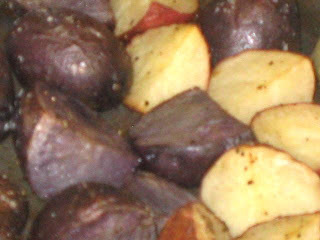 But when I turn the earth something magical occurs--along with the clods of soil perfectly formed red and purple potatoes appear. There's a bit of searching that goes on. Did the first spade-full turn up all the potatoes? Or are there more down there--deeper, deeper--waiting to be discovered? I sift through the soil with my hands, breaking clods apart, and quickly have a bowl full or potatoes. We wash and scrub them, cut them into pieces, toss them with extra-virgin olive oil, salt, pepper and roast them in a 325 degree oven until tender. We love Swiss chard and it thrives in our garden. Do we have the perfect conditions for Swiss chard here, or is it really so easy to grow? I don't know. I am always tempted to plant more and more of it. We even had a couple of volunteers this year. They came up in the flower bed, where I'd sown tansy and coreopsis. So it was the volunteers I harvested first, gathering the stalks in one hand, then cutting them close to the soil with a serrated knife. Most recipes focus on the leaves of the chard, something I don't quite understand. The tastiest parts are the stems. After washing them, I roll the stems and leaves on a cutting board and chop everything roughly into pieces. This will make a large pile. I toss these into a heavy skilled where I've been sauteeing sweet onion in extra-virgin olive oil, a bit of chard at a time, since all of it would never fit in the skillet. 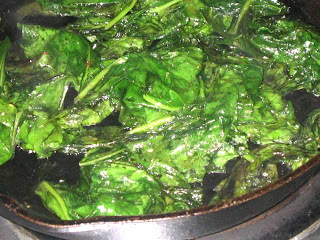 Place a handful of leafy chard into the skillet with a bit of water, cover the skillet for a minute to let the chard cook down and reduce in size. Then add more chard until the whole pile is in the skillet, simmering. Season with salt and pepper and continue cooking gently until the stem parts are tender, about 30 minutes. 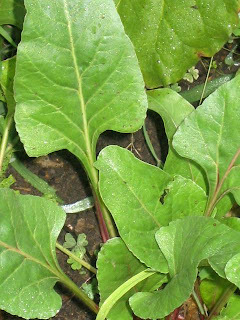 If you are using red chard, the stems will be much paler now. When they are cooked, I like to add about a tablespoon of pomegranate molasses (available in Middle Eastern groceries), a sprinkle of sugar and a splash of red wine vinegar. All of these flavors mingle well with the earthy tartness of the chard. Finally we had some cucumber to make a salad. I planted cucumbers mostly for pickling. But when you leave your garden to go on vacation, cucumbers will grow out of control. Some of the cuckes grow to the size of small torpedoes. They turn a light orange color at that point--like a squash--but they are still perfectly edible. I peel them, cut them in half lengthwise and scoop out the seeds. Then I slice the two halves thinly on the mandoline. Place the half-moon slices in a colander set over a large bowl. Season the cucumber generously with kosher salt and refrigerate for a couple of hours or overnight. The salt will draw out much of the water. I now dress the cucumber slices very simply with white vinegar and finely chopped dill. You could also add a bit of heavy cream to make a finished salad. When everything was finished--prepared simply, mind you, no fussing--we sat down for another dinner out of the garden. The flavors were bright and strong, the food could hardly be fresher. And of course we were feeling proud and satisfied, having grown it all right outside our front door. All told, I've been away from the garden a full month this season. Long enough for the cucumbers to swell to bursting, the okra to get tough as wood, the beans to shrivel on the vine. But last night we cut through all the whining, determined to make a meal of our labors. First, the carrots. I used to just scatter the carrot seed in patches, but I was never one for thinning the sprouts. So I've gotten smarter and started poking small holes, adequately spaced, in the soil with my finger, then planting the seeds one-by-one. We have three carrot patches now, planted in succession with many different varieties, and the ripest one was in full bloom. 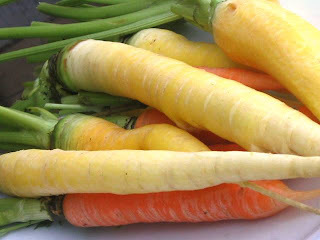 For some reason, the yellow carrots are the first to bolt and the most temperamental where ripeness is concerned. So I went after the flowering carrots first and sure enough that yielded a bounty of goldens. These and the few traditional carrots I cleaned, peeled and grated into a curried carrot salad with apples. The dressing is simply mayonnaise mixed with some homemade chive vinegar (or white wine vinegar), lemon juice, extra-virgin olive oil (you could use a lighter oil, such as grapeseed or walnut oil), curry powder, sugar, salt and pepper. I usually add raisins as well, and you could throw in some toasted almonds or walnuts, but I was on a mission and forgot. Note: Harvesting and cleaning carrots is fun but labor intensive. It helps to have a helper. Next, the beets. I had wonderful success last year with fall Chiogga beets, but darned if I can get the spring-planted beets to do much. They only want to grow so large, then they stop growing and just sit there soaking up the sun. I think I need more organic matter in the soil. But in another area with well-amended soil, I planted golden beets and these have thrived. I started pulling a few of them and some proved to be enormous. After cleaning and trimming, I set them to cooking in a large pot of water until tender. Remove the beets to cool. 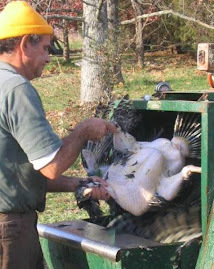 When they can be handled, rub the skin off and trim the remains of the green tops. Cut into slices or wedges, then dress with extra-virgin olive oil, red wine vinegar, salt, pepper and chopped chives from the garden. Even better, add wedges of ripe red tomatoes and slices of red onion. Finally, I have to say I am kicking myself a little over our dark Italian kale. It was doing fabulously--it was far and away the star of this year's garden--even after we'd been gone in Mexico for two weeks. That is, into the beginning of August. But a terrible heat wave descended on the District of Columbia lasting several days while we were away in Maine and the plants suffered a mighty scorching. The harlequin beetles were moving in for a feed--a sure sign that the Brassicas are done. So I pulled all the plants out of the ground one-by-one and selectively culled the leaves that had not been too terribly affected. What I harvested was a mere fraction of what the plants had actually produced. But such are the consequences of being absent from the garden at the precise moment when it needs your attention. My timing, in other words, is pretty atrocious. Nevertheless, what we had was enough kale for several meals. To salvage the lot, I just put a large pot of salted water on the stove to boil, trimmed the ribs out of the kale leaves, roughly chopped them, then cooked them at a very low boil until they were tender, about 30 minutes. Most of the cooked greens I would pack and store either in the fridge or the freezer for later use. For our meal, I sauteed some onions from the garden, then some hand-crafted, hickory-smoked bacon. I then chopped the bacon and put that and the onions and three generous portions of the greens into the skillet with the bacon grease and heated it all through with a splash of apple cider vinegar, salt and pepper. So much for cooking. Now, time to sit back and enjoy the view. Since starting the garden, we've had a family of goldfinches come to visit, now for the second year. One of them was perched atop the cone flowers, digging for seeds. When we sat for dinner, we noticed out the window that a squirrel had found a way to hang upside down at the top of the 10-foot-tall sunflower stem, and was munching away on the seeds. Last night I paid a visit to our friends Keith and Janice who, for almost the last month, have been taking care of our guinea pig, Shadow. The pig was in the pink of health, and Keith ever so thoughtfully had purchased a big bag of Timothy hay. But not just any kind of hay. No, this was organic Timothy hay. I couldn't help but chuckle to myself at what seems a bit ironic. Or perhaps just a bit ironic to me. Last week the New York Times opined that we may be on the cusp of the demise of traditional farming as we know it. Not just more family farms going under in an Isn't it Sad kind of way, but the end of individual farming, period. This because of the rapidly escalating price of farmland, due in large part--you guessed it--to the rush to make ethanol. The boom in ethanol to fuel automobiles, a wasteful, polluting and energy-stupid technology supported and even spurred by our own government, has helped double the price of corn, resulting in record corn planting and now a rush to buy more land on which to plant corn. In addition to driving up the cost of food here in the U.S., creating a tortilla crisis in Mexico, and promising to widen the huge dead zone in the Gulf of Mexico caused by artificial fertilizers, ethanol is now putting farm land out of reach to anyone who might have thought of starting a farm or adding to his acreage. What the Times foresees is a point in the not-so-distant future when all farming operations will fall into the hands of huge agriculture conglomerates and investment syndicates. The trends are heading in that direction: the average age of farmers in this country is somewhere around 65. Young people just don't want the hassles. Farm products are becoming ever more commoditized, driving prices down on the production end, meaning less income for farmers. The processing of farm products is becoming ever more consolidated and distant, meaning higher expenses on the production end and thus less income for farmers. Local zoning and land use laws hardwire the development of sprawling strip malls, parking lots and roadways, eating up farm land and further increasing the premium on acreage. With land prices escalating, farmers--what's left of them--are caught in a vice grip. The act of farming, meanwhile, becomes ever more industrial and impersonal. The use of artificial fertilizers and pesticides increases, destroying the soil, eroding it, sending it out to sea. We are, in short, through our government and our taxes--through our indifference to the land and our allegiance to the automobile above all else--dismantling our heritage of local farming in the most pernicious fashion. So when people say they're buying "organic," I have to chuckle, in a sad sort of way. Yes, there may be more of us every day choosing organic, choosing to buy local. But we are a small minority. The feeling I get is that the vast majority of our countrymen--our leaders, even--really could not give a damn. We are slipping ever so inexoribly into a Soilent Green future where we won't have any idea where dinner came from, and the family SUV will be running on corn. Here in Maine, I brought my laptop because the town library in Freeport (just up the road from L.L. Bean) is equiped with a wireless router. Better still, the wireless reaches outside the library building, so I could type away at the crack of dawn--even when the library itself was still dark--sitting at a picnic table on the grounds. Then it was off to the grocery to shop for breakfast. If this sounds like a bit of a rush, and not the best conditions for composing thoughtful blog posts, you may be right. I'm not making any excuses. Anyone driven to write on a daily basis has to be prepared to deal with the conditions that present themselves. In my youth, while studying in France, I spent three months touring the country on bicycle. Foolishly, I thought I would not survive the trip without my portable Hermes typewriter. I carried it in a large backpack, along with a tent, bedroll, kerosene lantern and sundry other equipment, all of it actually making it as far as a farm house near the Loire valley, where the kind farmer agreed to let me stash the stuff in an unused bedroom for a month, when I returned in a rental car to retrieve it after finishing my tour. I have spent the last couple of days trying to correct all the typos, unfinished words and grammatical errors I left in those blogs that were written in such a rush, beginning in Mexico. A vacation always leaves you with a changed perspective on things, and now I see that I am typically in a rush to write these posts on a daily basis. Which raises the question, why then write on a daily basis? And I suppose the only logical answer is, because otherwise I would forget what I want to write. So the blog really is a sort of diary, a diary for all the world to see, and a way of sharing--one hopes--some useful information, even when the writing isn't every bit as good as one might desire and full of typos and unfinished words and grammatical errors. And maybe not written from the same perspective on food as one had the day before. I come away from Maine thinking we have, in our daily lives, become so detached from the food we eat and the meaning of it to us as humans. 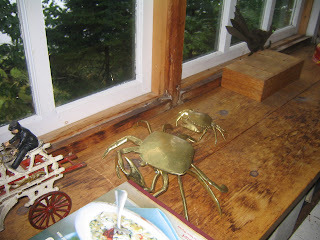 On vacation in Maine, food was clearly about memories and how our meals there--such as steamed lobsters and all that entails, and taking Italians out on the boat, and blueberry pancakes in the morning--knits us together in our common humanity in ways that we carry in our memories long afterwards. 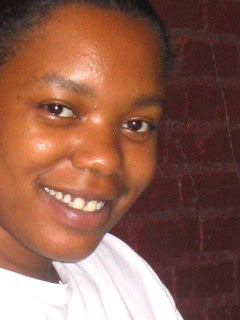 A few simple things--the sound of ice being replaced in the coolers, or baking Indian pudding in a broken oven, or having to secure the refrigerator door with a bungee cord-- become touchstones that we refer to in our collective associations ever after, binding us up in powerful and lasting friendships. We make great stories around food, and the stories tell us who we are. 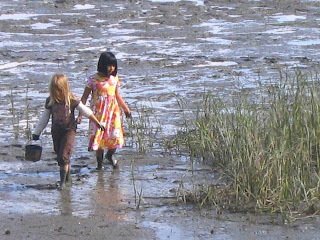 An image that stays with me is the one of our 7-year-old daughter and her friend Alice walking barefoot around the mud flats at low tide, looking for clams. 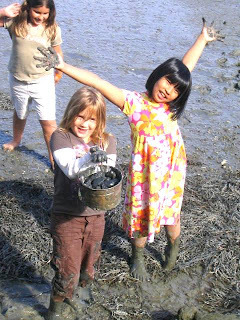 There were a number of professional clammers out that day, raking through the mud and tossing bivalves in their plastic buckets. A medieval scene, almost, the men hunched over in the most awkward position, drawing their forked tools through the mud, proving that even in a digital world there are only so many ways to collect clams. From my spot on the beach, I watched the two girls approach one of the clammers, saw the clammer stop his work, stand up and speak to them in a low vo ice. He dropped a few clams in the small bucket my daughter was carrying and later she came to me--her hands and legs and clothing smeared with gray mud--holding out her bucket. "Look, Daddy! Look at all the clams we found!" But of course you cannot stop the clock, and I was jolted back to reality somewhere on the New Jersey turnpike where the Saturday morning beach traffic had reduced I-95 to a slow crawl on our journey back to the District of Columbia. Eventually we could endure it no longer and we pulled into the Molly Pitcher "rest area" where there was actually a line of cars trying to enter the parking lot. The scene was absolute madness, automobiles everywhere jockeying for position closest to the food pavilion. A crush of humanity, like you might see at a big sporting event. Long rows of gas-hungry SUVs stuffed with luggage and vacation gear. The lines waiting for fast food were absolutely beyond comprehension. And I could not help thinking, there is no hope. Yet here we are, back in the District of Columbia and our garden that is now barely distinguishable from the yard (meaning weeds). There's been a tremendous heat wave while we were gone. Friends have kept the plants watered and I am collecting more and more cucumbers for pickling. The tomatoes are climbing their cages--I seem to have acquired a Roma plant I didn't know I had. The yellow cherry tomatoes are golden ripe and in great profusion. It is time to harvest the Italian kale, which has endured a mighty scorching. There are a few things you can do with blueberries in Maine. Meg, the professional baker in the family, makes a terrific blueberry pie. In fact, my wife brought several pie doughs she'd made here in the District of Columbia and paired them with Meg's pie filling for dessert one evening. You can also make blueberry muffins, but Shelly prefers her muffins with raspberries. Over the years, we've become accustomed to raspberry muffins in the morning on a daily basis during our stays in South Freeport. But curiously, we did not see Shelly making her usual muffins this year. Her thoughts must have been elsewhere. The local blueberries in Maine are reputed to be exceptional. They are much smaller than what you typically see in the store. And of course there is the classic children's book Blueberries for Sal, by Robert McCloskey, singing the praises of Maine's berries. I took a bit of heat for purchasing blueberries from Michigan. What can I say? Those were the berries for sale at the local grocery, Shaw's. And besides, I don't see anything wrong with blueberries from Michigan. Michigan is famous in its own right for blueberries, and I've been eating them all my life. The only question, as I saw it, was this: Were there enough days left in our vacation for all the pancakes I had in mind for these blueberries. At home in the District of Columbia, I am famous for the blueberry pancakes I make on Sunday mornings. We usually make an annual pilgimmage to Butler's orchard, way out in Germantown, MD, to pick 15 pounds or so of blueberries and then freeze them for the year to come. I'm sorry to report we never made our blueberry picking appointment this year. We still have a bag left from last year. Finding authentic buttermilk these days, like so much else that used to arrive in its natural state from the farm to the grocery store, seems darned near impossible. Sometimes at the farmer's market you will see a vendor making a big deal of selling quarts of "real" buttermilk. You may then walk away mumbling to yourself, wondering what the difference is between the "real" buttermilk being sold at the farmer's market and the stuff you buy in a plastic carton at the grocery stored labeled "buttermilk." Originally, "buttermilk" was the liquid left over from the process of churning cream into butter. It is tart, low-fat, and sometimes flecked with bits of butter. 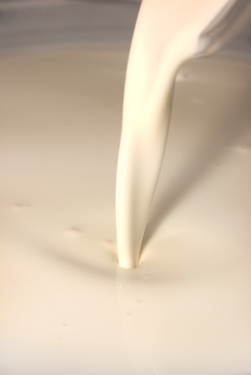 Nowadays, "buttermilk" is a manufactured, cultured product made by adding lactic acid bacteria to regular or skin milk, then fermenting it for a period of days. It's that acidity that makes buttermilk ideal for a chemical rise in baking, as in pancakes and biscuits. Because of the acidity, it will also keep for months in the refrigerator without going bad. Still, reading the labels on the "buttermilk" products at the supermarket can be a jolt to the senses. I found three varieties of buttermilk under three different labels at the Shaw's in Freeport. One of them listed the following ingredients: "pasteurized culture fat-free milk, modified food starch, mono and diglycerides, carrageenan, locust bean gum." The second product listed all of those ingredients plus "modified corn." If you can find authentic buttermilk, so much the better. Otherwise, proceed with your pancakes as follows: In a mixing bowl, place 3/4 cup unbleached, all-purpose flour, 1/4 cup corn meal (yellow or white), 1 teaspoon baking soda and 1/2 teaspoon salt. Mix thoroughly. Meanwhile, in a small pan, melt 3 tablespoons butter. In a separate bowl, mix 1 cup buttermilk, 2 well-beat eggs and the melted butter. Pour the liquid ingredients into the dry ingredients and stir together until just blended. Cook the pancakes in batches on a buttered griddle or in a heavy iron skillet over moderate heat. After pouring out the pancakes, dot them all over with blueberries. Flip when browned on the bottom and cook another minute or two until the pancakes are done. Hole them warm in the oven, or on a plate set over a pot filled with steaming water, using a pot lid to cover the pancakes. This recipe will make six large pancakes, or eight medium-sized pancakes. Serve with butter and warm maple syrup. Warm blueberry syrup is even better, if you can find it. And if you have room for a few more calories, some nice hickory-smoked bacon or locally-made breakfast sausage caps this breakfast nicely. A day on the water with a bag of Italians represents something of a culmination of our week here in South Freeport, Maine. Italians are to this part of the country what steak subs are to Philadelphia. 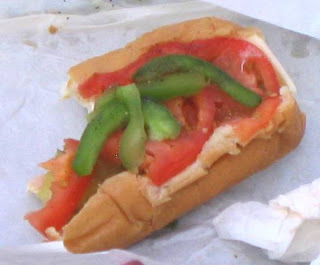 We get ours from a local deli called Pat's, this particular version being a soft hot dog roll (known hereabouts as a "top-cut bun") sliced open and loaded with cold cuts, provolone cheese, thin strips of green bell pepper and sliced tomato. 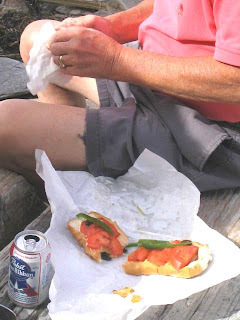 The point of sailing with Italians isn't so much the sandwiches, of course, as the journey. Italians immediately conjure up summer days from the past spent lolling around Casco Bay, landing on one of the small islands, finding a place to picnic--the sea breezes heeling the boat and stirring conversation, feet in the water and looking for purchase in the stones, scouting locations for the luncheon feast, climbing rocks, spreading napkins, oiling the Italians, guzzling beers. So it was on this particular trip as we marched to the marina with our lBean bags load ed with sweaters and sunblock and potato chips, the several coolers prepared by Peter and jammed with sodas and water bottles and Becks and Pabst Blue Ribbon (the latter would be Peter's current favorite brew, Carling's not being available in Florida, where he now resides). 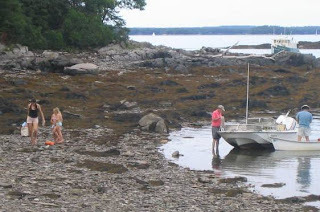 Originally we had planned to lunch on an island called Goslings, but Peter, who was ferrying the teenaged girls and the young girls in the Boston Whaler, reported over the radio that Goslings was too crowded (even on a Thursday afternoon) so we headed for the next closest island, Little Whaleboat. The beach was perfectly deserted as we approached in the dinghy. 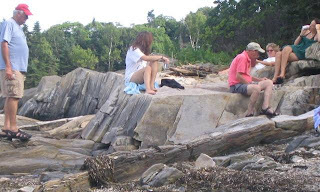 The teenaged girls were already stripped down to their swimsuits with th e younger girls scampered off to climb rocks and collect clam shells. We located a shelf of rocks with a good view and sufficient surface to spread out our victuals and there we settled in to devour our Italians. It was a perfect place to create new memories over sandwiches, only the occasional squawking of the seagulls to break the silence, sailboats gliding past in the distance, Shannon and John discussing the small rock ledge out in the water they had encountered last week with the sailboat. "It isn't on the chart," Shannon repeated a number of times, as if to assure himself that he hadn't hit the thin g on purpose. Down on the beach, the teenaged girls were wading in the water. Finally, Isabella plunged in and swam slowly out into the small cove, bobbing up and down using her breast stroke. 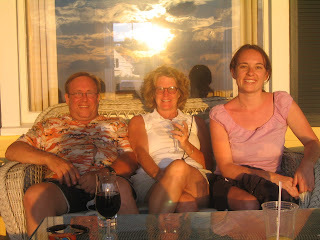 We watched, savoring our Italians, munching on Cape Cod potato chips and drinking our beers. On the return leg, the breeze kicked up and now we were taking it off the starboard bow, rather than from behind, so it was more of an interesting sail, not the leisurely event when we'd had a light wind behind us. 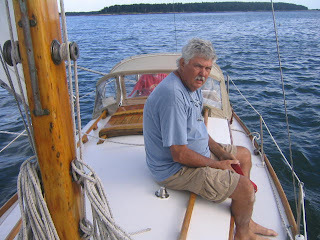 Shelly took the opportunity to read a chapter on sailing in Maine from Roger Angell's new memoir, he being the longtime sports writer for The New Yorker. Mr. Angell has it right, we are pretty much just loafing out here in the water, we sailors. The lobster boats that we pass are doing true work. So mehow we got lucky and can simply enjoy this marvelous spot, the bay with its clean sea water, the fresh breezes, the pine-studded islands. We find all sorts of excuses for getting out on the boat--eating Italians for lunch being one. We hope not to hit anything lurking under the surface. Really, we are just city people who miss the outdoors, who want to re-live all the good times we've had on the water and most of all draw closer to the pulse of the planet. It seems that any house near the water automatically attains "cottage" status here in Maine. But the cottages seem to be getting bigger and bigger, with more and more modern accoutrements, to the point that they are no longer distinguishable from what we landlubbers "from away"--as visitors are known--refer to as "houses." Except, as I said, they are near the water and happen to be planted in the soil of Maine. The place where we are staying here in South Freeport comes much closer to what I think of as a true "cottage." In fact, we commonly refer to it as "The Red Cottage," exactly because it is painted red, like a barn, on the outside. The cottage is not winterized at all. There is no insulation. 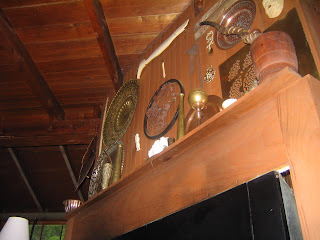 So, from the inside, what you see are all the bare two-by-fours and ceiling joints, as well as the knotty pine boards that constitute the sides of the cottage and the underside of the roof. You also see the electrical wires running here and there to wall switches and light fixtures and wall outlets, occasionally wrapping or turni ng around an ancient ceramic insulating terminal. The floor boards, meanwhile, have been painted a battleship grey, but overlaid with a playful scheme of dots in various primary colors, so you hardly realize you are walking across a bare wood floor nearly 100 years old. There are five bedrooms in all, three upstairs in the original part of the house, and two downstairs in a fairly recently renovated basement. So the cottage theoretically (and in actual fact) will sleep 10 or 11 persons, which does make for some interesting situations around the lone bathroom. A second bathroom in the basement would make an abundance of sense, but remains a fantasy for us guests. You can't choose your kitchen when you are on vacation and this one has its quirks. It is a fun place to work, with plenty of space and the timbers painted a bright yellow. Even the underside of the sink, which is completely exposed without any artifice of cabinetry, is painted the same cheerful yellow, except for the PVC plumbing pipes. There's a microwave oven, separate cabinets for pots, pans, cutlery, placematts and liquor. Conveniently, there are even pots large enough to boil lobsters, something we do frequently, and a blender for making lobster bisque, should the mood strike. The seal around the inside of the refrigerator door is barely functional. The owners of the cabin have addressed this issue by attaching a bungee cord to the wall. In the even you should need something out of the fridge, you have to unhook the bungee cord from the handle on the door. When you are done, you close the door and stretch the cord to re-attach the hook on the handle. This has been the system for maintaining cold inside the refrigerator for as long as we can remember. The largest skillet in the cottage is an old restaurant model, heavy steel, whose bottom is so badly warped that the only way to use it is to find a smaller pot to place somewhere under the long handle, so that the skillet will balance awkwardly on the electric burner. Still, there is so little surface area of the skillet underside touching the electric element that actually cooking with it is a challenge. Another challenge is the electric oven. The thermostat has been broken forever, so that when you set the temperature for, say, 275 degrees, what you actually get is something closer to 55o. This differential in cooking temperatures made itself evident fairly quickly. I think we were making cookies that needless to say baked to a crisp much more quickly than we were expecting. We made a quick study of the oven and I think even wrote out a translation so that we could actually use the oven and obtain the desired temperatures. I don't know where that went, but we did purchase an oven thermometer that still hangs from one of the oven racks, so you can at least see how far out of whack it is and make adjustments. Again, the owners of the cabin seem to think the hanging thermometer is solution enough. No need to bother replacing the thermostat. We've heard that when other renters complain about the oven, they are told something along the lines of, "There are professional chefs you use that oven and they do just fine." Meaning us, I guess. But the reason for this post was to talk a little about Indian pudding. Indian pudding, as the name implies, is a traditional New England dish that recalls a time when there was active trading between Boston and the sugar plantations of the Caribbean Islands. The main ingredients are so basic and so identified with the original colonies--corn meal, molasses, eggs, milk, sugar--that there is hardly anything more American. But my guess is there may be only three people on the planet who still know what Indian pudding is. Yet Indian pudding is a favorite dessert of our friend Shelly, who grew up in South Freeport, so we try to make it at least once a year while we are here. Last night we were eating leftover steaks with freshly sauteed shrimp and my famous three-hour green beans. Our friend Tom, the world traveler and bon vivant, had brought a selection of French wines whose names we couldn't pronounce. We thought it was the perfect meal to be capped off with Indian pudding and ice cream. Be prepared to cook this pudding in the oven for up to several hours (it's not a quick dish at all, but not difficult). We cooked it in a large Pyrex dish. This version if from Marjorie Mosser's "Good Maine Food." To make a pudding for eight persons, first bring 1 pint of milk just to a boil, then stir in 1/4 cup corn meal. Cook 10 minutes then add 1/2 cup molasses, 1/2 cup sugar, 1/2 teaspoon salt, 1/2 teaspoon cinnamon, 1 egg (well beaten), 2 tablespoons butter, 1/2 cup raisins. Mix everything together, then add 1 pint cold milk. Transfer the hot mixture to an oven-proof bowl or casserole and bake at 250 degrees for 2 hours, or until the pudding has set. 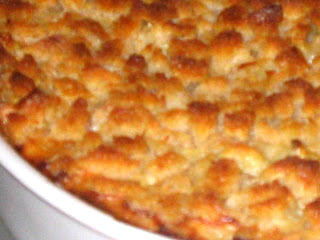 When it has baked 1/2 hour, stir the pudding and add 1 cup of cold milk. It will finish baking on its own. To serve, remove pudding from oven to cool a bit, then scoop into bowls with your favorite ice cream or perhaps some whipped cream with just a drop of rum.